We’re all in search of the same goals in life. Riches, honor, love, honesty, beauty, good health and the perfect place to see fall foliage in all its glory. You’re on your own for most of that stuff, but I can help you find the best spot for leaf peeping. The Cherohala Skyway is Heaven for Leaf Peepers. Never heard of it, right? 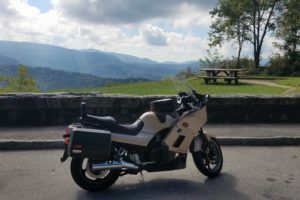 It’s amazing how this National Scenic Byway is unknown — except by motorcyclists who venture from everywhere to swoop atop the hills from Tellico Plains, Tennessee, to Robbinsville, North Carolina, for forty-plus magnificent miles. 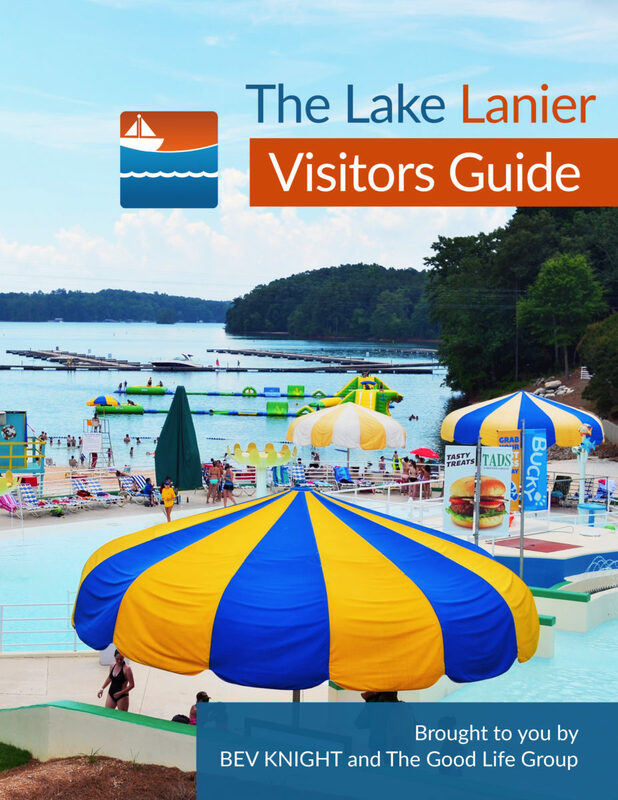 It’s a bit more than a day trip from Lake Lanier, that’s worth the ride. The Cherohala Skyway was opened and dedicated in 1996. The road has been designated a National Scenic Byway. The road cost over 100 million dollars to build. The Cherohala Skyway crosses through the Cherokee National Forest in Tennessee and the Nantahala National Forest in North Carolina. The name “Cherohala” comes from the names of the two National Forests: “Chero” from the Cherokee and “hala” from the Nantahala. Don’t worry. You don’t have to go fast on two wheels to enjoy nature’s glory. Take your car and stop at the dozens of scenic overlooks at your own pace. You’ll find picnic tables, spectacular vistas, occasional restrooms and friendly tourists. You will not find gas stations, restaurants, snack bars or lodging on the Skyway. Spend the night at a cozy cabin in Tellico Plains or at a fancier Bed & Breakfast. 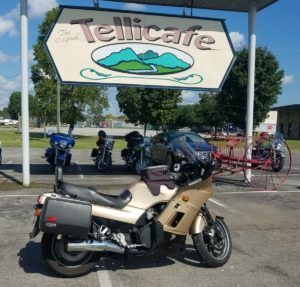 Enjoy a delicious meal at Tellicafe, one of my personal favorites when riding Grasshopper, the Humble Ninja in the mountains. 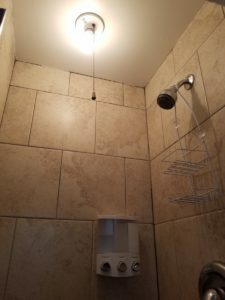 There are many more options for places to spend the night or a weekend on the eastern end of the Cherohala Skyway in Robbinsville, NC. “Historic” in this sense means “back when building codes allowed metal chains to turn on light bulbs in showers.” Seriously. An electrifying oversight in my opinion. The best part of leaf peeping on the Cherohala? Even if you miss Peak Peeping Day, you’ll enjoy the ride, the impossibly glorious scenery and the nice folks you bring along. Unless someone gets hungry or you run out of gas because you didn’t believe me when I wrote that you cannot get gas or food on this Scenic Byway. Don’t doubt me. I’m a writer. The Cherohala Skyway is easy to find. Simply go north on Route 129 from Gainesville and/or Hall County and follow the signs. You’ll end up in Robbinsville in a couple of hours. Have a nice meal. Spend the night. (Choose wisely.) Have a nice breakfast. Buy batteries for your camera. Fill up your gas tank and pack a lunch. Then, follow the signs out of town and prepare yourself for a jaunt along ridges on a nice road that would cost a jillion-billion dollars to build today. We get to ride it for free. Even if you must do so in a car and instead of a motorcycle. When you get to the end, turn around and do it again. Robert, is that 129/Tail of the Dragon? 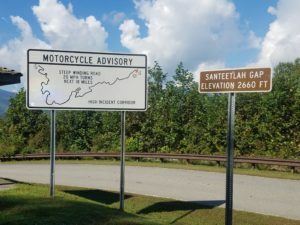 Deals Gap, also known as The Tail of the Dragon, is a different place. The 318 curves in 11 miles makes it popular for enthusiasts. 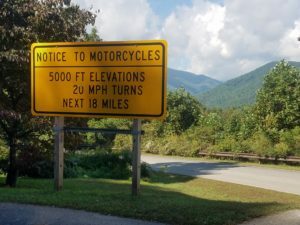 The Cherohala Skyway is almost five times as long and has magnificent views, along with being a thrill in a car or on a bike.